Amy Xu/Team Strong Heart in the News! Check out this article printed today (5/28/10) in the St. Paul Pioneer Press! 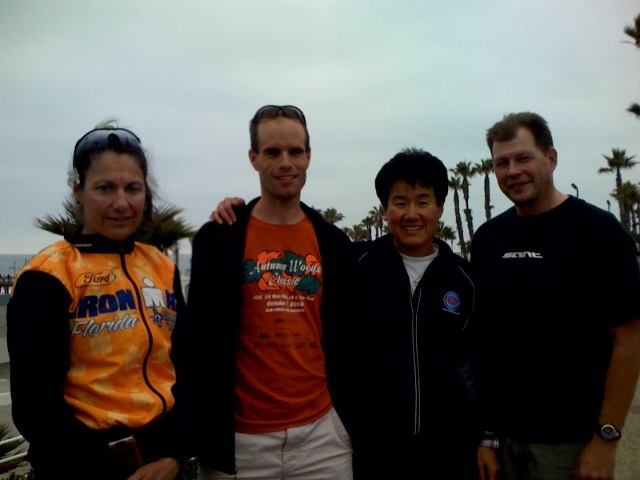 Welcome on board, Jay (from right -- TEAM STRONG HEART 4-person team -- Jay, Amy, John, Melinda, taken in Oceanside 2008 RAAM). Jay came on board this week to crew us from MN to CO and is the designated reporter for TSH website/facebook for race progress. Thank you. Please join me to thank the following individuals for volunteering their time in helping the Team Strong Heart mission in 2010 Race Across America. 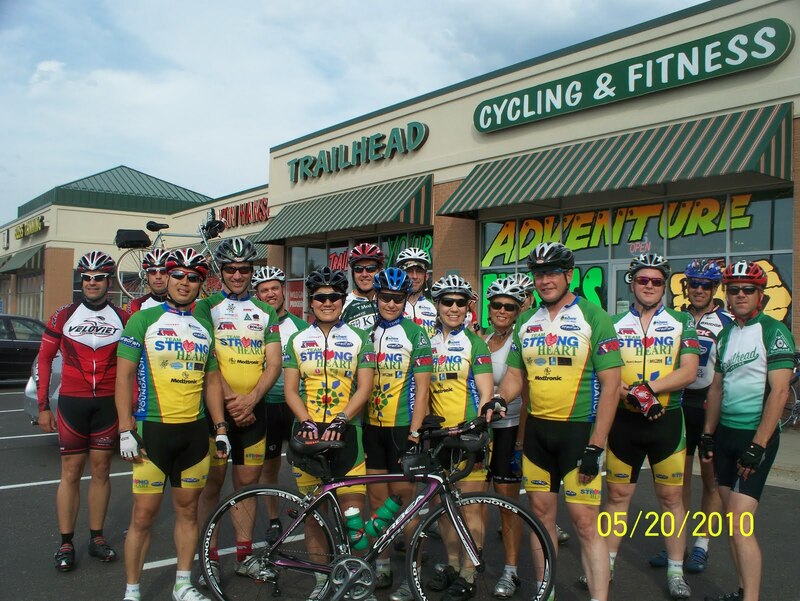 Team Strong Hearts from local cycling groups came out for a memorable evening ride. (Courtesy of Quang Vo and Larry Sayler). As Team Strong Heart crew and rider are preparing its mission close to its final stage before heading to the race start (Race Across America 2010), co-crew chief, Michelle Pearl, organized a mission fundraising event last weekend -- this time, in the Heart of the Race Across America -- its headquarter -- in Boulder, CO.
Michelle gathered all the donated items from her friends and local CO businesses (bike shops, band, restaurants, hotels, spas, bakeries, etc. etc. ), as well as Team Storng Heart sponsors from MN, and raised $2,100+ on Sat. night. RAAM president and CEO attended the event, pumped up our team and supporters, and praised all the efforts we have done for Camp Odayin charity mission. 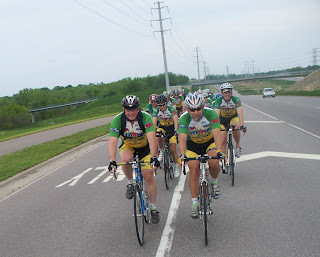 On behalf of Team Strong Heart, I invited the RAAM organizer to visit Minnesota this fall and give us a recap of RAAM 2010 and RAAM history. Counting down 22 days to start, Team Strong Heart has many tasks ahead before the race start. As Eric Kenny, the Team Strong Heart 4th year coach advises -- obstacles usually happen when you take your eyes off from the goal -- So we stay focused. "I would imagine that most of us have ridden a bike at some point in our lives. The first time you learned how to pedal, and keep your balance was such a euphoric moment. Then maybe you did your first 10 mile ride whether it be to work or with your family, or something bigger like a weekend club ride preparing for a 100 mile century or triathlon. At some point, most of us have experienced some perception of what it means to ride your bike, but can you just imagine for one second, riding your bike for 20 hours, then sleeping for 3 hours, and then getting up and doing it again for 13 days? 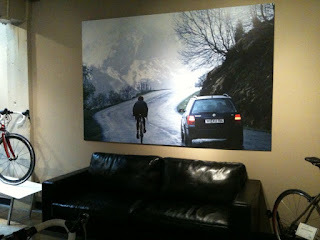 On June 8th, 2010 there will be a very select group of athletes doing just this feat, in the Race Across America (RAAM). This is the 29th year that the RAAM (which is considered the hardest international endurance event) will take place. Athletes will leave from Oceanside, CA traveling 3,000 miles to Annapolis, Md, and are given 10-13 days to complete it, depending on their category. Each year several teams participate in this incredible race that has no prize money. Aside from the personal challenge this race poses to each athlete, it is also one of the largest fundraising opportunities for hundreds on different charities. This year, Team Strong Heart will be competing in the RAAM for the fourth year in a row. The team was developed in 2007 by Bernie Karferlein, after attending a fundraiser for Camp Odayin, a camp in Stillwater, MN for kids with congenital heart disease. He was so inspired, that he decided to use his love of cycling as a platform to raise money for the camp, and participate in the RAAM. In 2007 Team Strong Heart raced a 4-person all male team, in 2008 they had a 4-person mixed team, along with a solo male racer, then in 2009 a 4-person all male team that took first place, and now in 2010, Amy Xu the first Asian American female to race in the RAAM, will be competing in the SOLO division. Team Strong Heart is based out the Twin Cities, Minnesota USA, and functions under the Silent Sports Foundation. Their mission is to raise awareness and funds for Camp Odayin. This camp provides a very special experience for kids all over the country with congenital heart disease, who's medical fragility limits their abilities to normally participate in such opportunities. The camp has an all volunteer staff including a full time pediatric cardiologist and nurse. They have high tech medical equipment available at all times for any emergency. The families who have already had to manage large medical bills, only have to pay a small administration fee, and otherwise the campers attend with funds given by donation. Although Amy is the SOLO racer representing Team Strong Heart, this mission is truly a team effort and can not be completed without the assistance of an efficient support crew. This year's crew is made up of 14 people. Each person has a vital job. Amongst those jobs includes a driver, navigator, feeder, bike mechanic, physical therapist, massage therapist, and nurse. This year's crew is an eclectic mix of incredible men and woman from all over the country that have come together, donating weeks out of their lives as volunteers to achieve the same goal. Months, days, and hours are dedicated to the preparation, fundraising, training, and strategizing for the Race Across America. 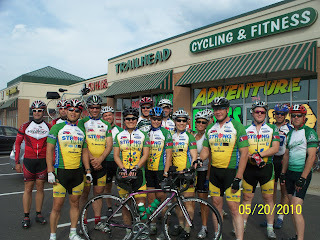 On June 8, 2010 Team Strong Heart will begin their mission on the start line, at the pier in Oceanside. You can track their mission and race progress, just as the kids at Camp Odayin and supporters will, across the country all the way to the finish line in Annapolis. On behalf of Silent Sports Foundation and Team Strong Heart 2010 RAAM, first of all, I want to thank you all for being a part of the Team Strong Heart 2010 mission to help Camp Odayin charitable cause in RAAM 2010. I welcome you on board. Also, I want to thank our co-crew chiefs, Sandy Roman and Michelle Pearl, for their hard work to get us all together in the last few months. Without them, this will not happen. I'm very grateful to all of you and look forward to being a part of this team and your rider. We come from many different parts of the country with all different background, yet as a whole, we are going for a common mission. I'm very proud of us. Moving forward, no matter what happens on this journey, we are the Team Strong Heart 2010, and we are a part of the Greater Team Strong Heart family now. 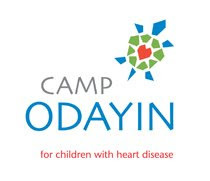 One of our main goals is to help bring awareness of cardiovascular diseases that Camp Odayin kids suffering in their daily lives. On our crew, we have a member whose family had experienced such devastated diseases, and we also have crew members who themselves are the survivals of other potentially life-threatening diseases. Currently, we are blessed with good health and great energy. In regards to the race event, our #1 goal is to make this crossing safe and a great experience for all of us. I encourage everyone to sit back for a moment to visualize our journey ahead and say a prayer for all of us as well as the loved ones back home, and thank our families and friends who support us in this mission. We'll have hundreds of thousands of folks back home, across the country and beyond, to support us. I'm not afraid of the challenges ahead even though the roads ahead are very treacherous and somewhat dangerous. Please take care of yourself and be vigilant to all dangers around us and help each other. Together, we CAN do this.